KATHMANDU, 12 May 2018 – Prime Minister KP Sharma Oli has said that growing trade deficit of Nepal with India, its largest trading partner has been a matter of serious concern. Stating that the two Prime Ministers took note of the outcome of the commerce secretary-level meeting held last month in Kathmandu to jointly initiate a comprehensive review of the existing trade and transit treaties and agreement to also address this issue, Prime Minister Oli expressed the ‘belief that India has both the capacity and willingness to address Nepal’s genuine concern’. He was speaking at a joint press meet held following bilateral talks between the two countries led by the two Prime Ministers, as part of the ongoing two-day state visit by Indian Prime Minister Narendra Modi. 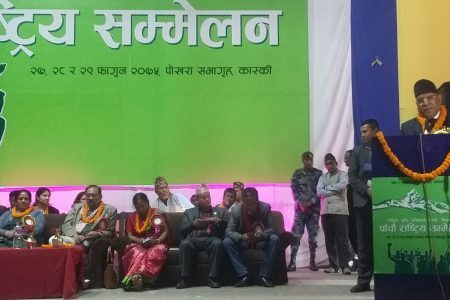 Referring to the problem of inundation faced each year by a large part of the Nepal’s tarai region, PM Oli said the two sides have agreed to immediately send a joint team to the inundation prone areas to take appropriate measures to address this problem. Oli also shared that he requested Prime Minister Modiji to facilitate the exchange of demonetized currency notes held by the banking system and the general public in Nepal at the earliest. 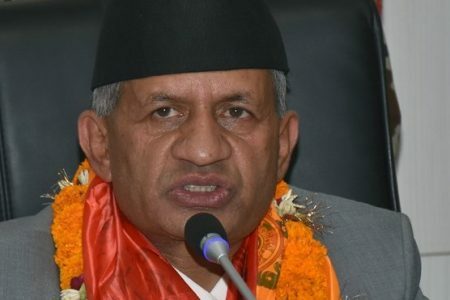 “We reiterated our firm commitment to take our relations forward on the basis of equality, mutual trust, respect and benefit”, he said while nothing that relations between neighbours are different from that of others and that neighbourhood constitutes top priority in Nepal’s foreign policy. “Our desire is to create a strong relationship underpinned by mutual trust so that it is not disturbed by occasional or intermittent differences that are natural between neighbours”, he noted. He also said that the two countries are independent and inter-dependent in many ways hence, peace, stability and prosperity in one contributes to the achievement and maintenance of the same in the other. 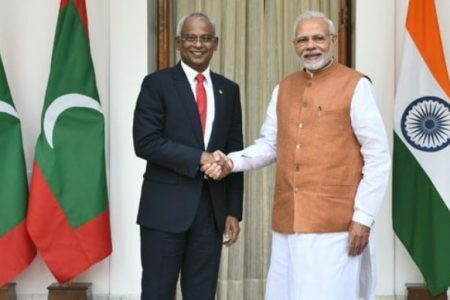 “We also agreed to take effective measures to implement all the treaties and agreements reached in the past, including to take concrete measures to realize the benefits of new partnership for agriculture and connectivity by rail links and in-land waterways. Appreciating India’s initiative to revise the guidelines and regulations on cross-border trade in electricity in consultation with stakeholders, PM Oli however said attention needs to be paid to full agreement of the power trade agreement signed between the two countries. Earlier, the Prime Ministers of Nepal and India held delegation-level talks on all aspects of Nepal-India relations. The teams led by Prime Minister Oli and Indian Prime Minister Modi discussed on various issues of mutual interests and benefits. Indian Prime Minister Modi is on a two-day State visit to Nepal from Friday. 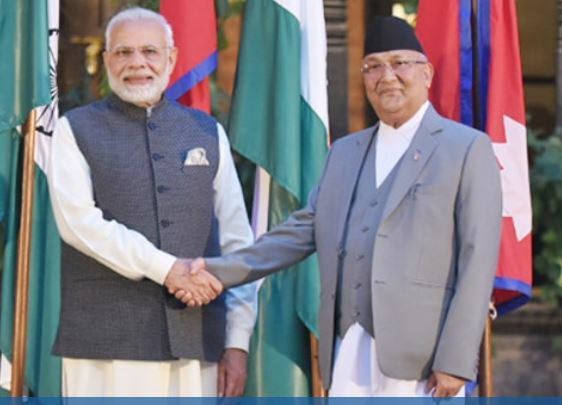 After the meeting, PM Oli said that they discussed on the ways of collaboration in the areas involving mutual benefits and also stressed on the implementation of the past agreements signed between both the countries. Saying Nepal has always been giving high importance to relations with neighbours, which is the important part of Nepal’s foreign policy, he clarified that they had intensive discussion to make Nepal-India relations timely. The Prime Minister added that mutual understanding and friendship between Nepal and India have increased while noting that no one can ruin the friendly relation between the two countries. Noting that they have focused their attention on posterity and progress of both the nations and the people as peace and stability have already established in both countries, PM Oli said that an understanding has been reached to give direction to the bodies concerned for the implementation of past agreements. Prime Minister Oli added that they held discussions on full-fledge support from India on the construction of four-lane bridge in Darchula district along the motor able road linking India and Nepal, modernization of agriculture and maximum use of information and communications technologies. Also present on the occasion were the Home Minister, the Foreign Affairs Minister, the Finance Minister, Prime Minister’s Political Adviser, the Minister of State for Health, the Chief Secretary, the Foreign Secretary and the Energy Secretary, among others.